Phyllis Richards O_Brien, age 89, of 633 Roxbury Street, Clifton Forge, Virginia went to be with the Lord Wednesday, June 13, 2018 at her residence, surrounded by her family and loved ones. She was born September 30, 1928 in Louisville, Kentucky to the late Hubert Clifford Richards and Eva McKenzie Richards. She was a 1949 graduate of the Chesapeake and Ohio School of Nursing, and was a retired registered nurse for Alleghany Regional Hospital in Low Moor. She was a member of St. Joseph's Catholic Church, Clifton Forge, and a volunteer for the Alleghany Highlands Arts and Crafts Center. In addition to her parents, she was preceded in death by her husband, Charles Patrick "Fuzzy" O'Brien in 2011; a sister, Wilma Jean Gray; and a special aunt, Stella McKenzie. 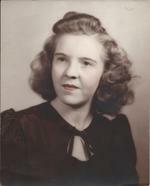 She is survived by four daughters, Patricia Vance and husband, Doug of Roanoke, Mary George of Covington, Catherine Tucker and husband, John of Clifton Forge, and Stella Clark of Clifton Forge; a brother, Hubert Lyle Richards and wife, Gwen of Tennessee; seven grandchildren, Mary Johnson and husband, Kenny, Derrick George, Christopher George and wife, Heather, Joyce Nicely and husband, Jamie, Jonathan Tucker, Rusty Clark and wife, Christin, and Landon Clark and wife, Leanna; ten great grandchildren, Logan, Austin, Jereme, Patrick, Chase, MacKenzie, Isabella, London, Zane, and Mercy; special family, Brook, Zachary, and Jacob Starkey; and a number of nieces and nephews. A funeral service will be held on Friday, June 15, 2018 at 10:00 a.m. in St. Joseph's Catholic Church, Clifton Forge, with Father Tom Collins officiating. Entombment will follow in the Mausoleum of Alleghany Memorial Park, Low Moor. The family will receive friends on Thursday evening from 6:00 - 8:00 p.m. at Nicely Funeral Home, Clifton Forge, with the Rosary to be conducted at 7:00 p.m. in the chapel of the funeral home. Friends may call at other times at the residence. The family suggests memorial tributes take the form of contributions to St. Joseph's Catholic Church, 620 Jefferson Ave, Clifton Forge, VA 24422.